Escape from the hustle of New York City but still see it from a distance and enjoy a half day of sightseeing on this private, 5-hour tour. Visit Weehawken, New Jersey for a breathtaking view of the New York City skyline that many tourists aren’t aware of. Then catch a scenic view of Manhattan from the Palisades Parkway. And finally, cruise along Seven Lakes Drive, located in the Hudson Valley region of New York, for a serene, scenic view of the lakes. 1st Stop: Weehawken, New Jersey, which is located at the top of a hill overlooking the entire island of Manhattan for a really spectacular view of the New York Skyline that not many tourist know about. 2nd Stop: Scenic view alongside Palisades Parkway on top of the Hudson River where it is overlooking the Island of Manhattan from the George Washington Bridge side. 3rd and Final Stop: Drive alongside the beautiful lakes. This 2 lane roadway stretches just under 18 miles (29 km) is a north–south parkway located in the Hudson Valley region of New York. 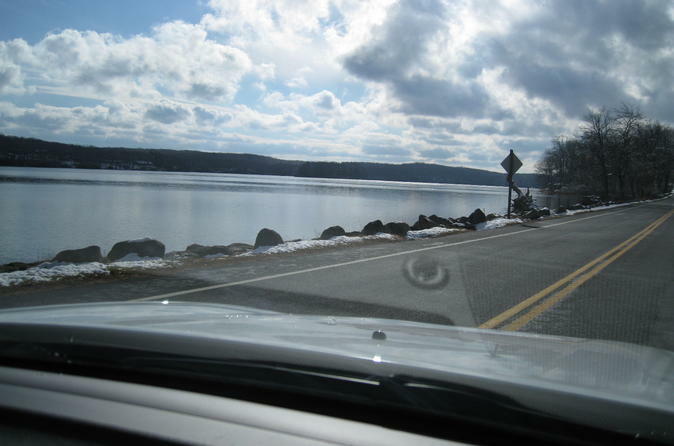 The drive takes you towards Harriman State Park, located in Rockland and Orange counties, is the second-largest park in the parks system featuring 31 lakes and reservoirs and approximately 200 miles of hiking trails. The Harriman State Park also includes two beaches, public camping areas, streams and scenic roads, and plenty vistas and vantage points.